OPA How long have you been writing Poetry? We would like to know the early stories about your growing up as a poet or writer in general. Who are your favorite Poets? What are some of your favorite genres to read and to write? Had they inspired you a lot, do you believe in inspiration as a guiding force behind writings at all? SCOTT: I’ve been writing poetry in a general sense for going on close to twenty years at this point, but much of that time was spent simply experimenting with different modes of expression as I developed my overall style. It is only in the past three and a half years that I would consider myself to be a serious poet, committed to the craft itself and the process of publishing for an audience. Poetry has always called to me through music, and I’ve been drawn to song lyrics since I was a child. But while growing up and attending classes in school, I admit that the cannon of classical poetry seemed stale to me, and it didn’t capture my attention or interest in those early years. My mind wandered more toward the imaginative visions provided by comic books, science fiction, and fantasy in those days, and these types of stories are what I emulated in my own writings as a youth. Now, though, I am a great admirer of contemporary poetry and have a desire to devour the work of those who are alive and relevant to the social structure in this current climate. It is those creating art today who wield the power and responsibility of setting the path toward a potentially brighter tomorrow. This is where my focus remains centered. OPA What has been the toughest criticism given to you as a writer? What was the biggest compliment? Did that change how or what you write? What has been the strangest thing that a reader has asked you? SCOTT: Critiques of one’s work, I believe, are a necessary and important aspect of the process. To receive an honest review from contemporaries can be helpful in many cases. Having several subjective perspectives from respected readers can lead toward a larger objective understanding of the material; its strengths and potential weaknesses. However, there is also criticism born of jealousy and ego, and this type of nonsense I simply cannot abide. Readers and editors have been very kind toward my work, generally speaking, and for this I am extremely grateful. Perhaps the biggest compliment I’ve received so far has come in the form of Pushcart Prize and Best of the Net nominations. OPA What is your favorite poem you have ever written? Compared to when you first started writing, have you notice any big changes in your writing style or how you write compared from then to now? SCOTT: It’s difficult to choose a single poem in this regard. Much of the decision depends on what my current mood might happen to be and which piece best fits that particular energy. The opening poem in my forthcoming book, Abstract Visions of Light, is titled “Transcending Definitions.” It has been translated into Albanian, Afrikaans, and Italian during the past year. So I’m proud that it has been able to reach several distinct audiences. Its theme deals with the true spirit of art being less about monetary gains (though this is also important in life) than it is about originating from the true depths of one’s creative expression. My style has hopefully progressed and evolved since I first began writing poetry. In the beginning I was focused more on crafting lyrics that had melody and musicality in mind. So there was more rhyming and an intention of making sure stanzas had similar rhythms in the structure of their dancing syllables. I still enjoy this method on occasion, but overwhelmingly my poetry is written more in free verse form at this point. I liken it to photography in the sense that I’m trying to capture a snapshot of time. Crystallizing a certain emotion or particular energy of the moment. OPA What has been your favorite part of being a poet or and author? What has been your least favorite? SCOTT: My favorite part of writing is the freedom of expression it allows. It can be a therapeutic practice when necessary, and this can serve to be positive for personal reasons. But mainly what brings the greatest joy is when I’m able to bring my individual perspective on a micro level to a larger audience and connect with readers on a macro level of the basic human condition. Perhaps the only worry I have at times is when I overextend myself and take on more projects, or offer more promises, than my plate can hold. I never want to let others down, but learning how to kindly say no to certain requests has been an important step for me to learn in life. OPA Did you get to quit your day job and become a writer and/or author, or do you still have a day job and writing is something you do for fun? If you still have a day job, what is it? SCOTT: I’ve held several sorts of jobs in the past. Working in a book store, helping manage the operations of a painting contractor business, delivering newspapers, and supervising a discount grocery warehouse that catered to low income families, among others. Right now, I am interested in the prospect of working at a juice bar, as one day owning a health food restaurant is a goal I’ve long dreamed of. In the end, jobs are one thing, but I always consider writing to be the true work that fulfills my purpose and mission in life. OPA Besides writing and reading, what is your most favorite thing to do? What genre are you most looking forward to explore during your writing career? Why? SCOTT: Some hobbies that I enjoy all fall into the general category of health and wellness. I love to take mindful walks around the city where I live, especially to local parks where I can sit in the woods and work. I played baseball in my youth, but now tennis has become my favorite sport because of the physical and mental pressure it creates that forces one to remain focused on the present point, not letting momentum ever swing out of control. I also enjoy researching nutrition, diet, and living food supplementation in the effort of maintaining the highest degree of health I possibly can on every level. Mental, emotional, physical, and spiritual. Though I must readily admit that a nice bottle of wine along with a feast of seafood is also on the list somewhere. We must have some semblance of balance in life after all! One genre that I would like to explore more in depth is non-fiction, as I’d eventually be interested in writing a memoir about my life’s journey thus far. However, there are a few more chapters that need to still be lived before I seek to pen such a tale in detail. 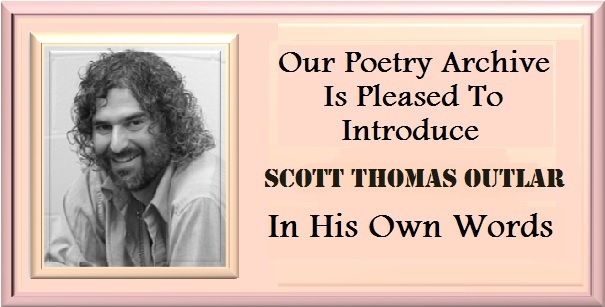 SCOTT: I would assume that there are certain people and/or groups/societies that are able to peacefully and happily live without having poetry or literature play a role in their everyday lives. Certain tribes in remote areas, indeed, have no written language to this day. Yet they survive, though likely with some sort of oral tradition that is passed down. In the end, human interaction is all that is truly necessary for the spirit to survive. But to thrive? This is an entirely different question altogether! Our experiences, short of being shared telepathically (which I do believe is possible to some degree), need to be written down so that they can be passed along through the generations. In the beginning came the word, then the shelter of caves, and eventually painting upon the cavernous walls followed suit. Thus arrived the first documented expressions of art/poetic thought. There was an inherent desire for one person to pass on the lessons learned from their life to whomever might happen to glance upon those primitive etchings. Was it, though, the thought of helping the next hunter down the line understand where the buffalo roam? Or just that tricky ancient artist ego bubbling up and wanting someone to admire their beautiful mind writ large? It’s like the age old question of how many licks it takes to get to the center of a Tootsie Roll Pop. The world may never know. OPA Our readers would like to know your own personal experience regarding the importance of literature and poetry in your life. SCOTT: Literature (especially comic books in my formative years) served to expand my mind, develop my vocabulary, and spark my initial interest in becoming a writer. The most important aspect poetry has played in more recent years since I began publishing has been introducing me to an incredible network of friends and contemporaries from around the world in various circles. Our shared love of the written word has led to some of the more memorable experiences I’ve enjoyed thus far in life. One of which was having the opportunity to visit London, England this past October and perform at The Poetry Café alongside Heath Brougher and Matt Duggan. As thrilling as the journey has been to this point, I’m even more excited about what the future has in store moving forward. OPA Do you think people in general bother about literature in general? Do you think this consumerist world is turning the average man away from serious literature? SCOTT: I think it’s fair to say that the love for literature in the United States has declined in recent decades. I can only comment about where I’ve personally lived. In part, the style of rote memorization in the education system is at fault, but there is also a noticeable drop off in attention spans that comes from easy access to television, internet, and various technological gadgets that can be found constantly in the palm of our hands. Having said that, I do believe the pendulum will swing, the scales will shift, and humanity’s will to evolve will shine through again. There will surely arrive a new cycle in which an appreciation for intellectual pursuits enjoys a righteous return to glory. OPA If humanity tries to understand tradition and modernism; do you think literature can play a pivotal role in obtaining understanding? If so, how? Again, how can an individual writer relate himself or herself with the tradition and modernism? SCOTT: Literature can certainly play a role in this regard, as general trends, styles, cultural mores, traditions, fashions, dialects, philosophies, and religions of each era are captured and crystallized by the writers who served as sociologists of their time by creating fossils that can be looked back upon by future generations to compare and contrast. In this way, current writers have a basic foundation upon which to stand as they craft new editions to this reciprocal cycle. OPA Do you think society is a factor in shaping you as a poet, or your poetry altogether? SCOTT: The political and economic atmosphere inside and outsideof the United States has served as a key influence in my writing. I have been contributing a weekly poem at Dissident Voice since the summer of 2014, and my work there often deals with subjects of cultural and societal concern. Speaking out against corruption in high places and standing tall against entrenched institutions that are disempowering to the human species are important aspects for any artist to tackle. It is not the most enjoyable material to deeply research or pen, but it is vital nonetheless. OPA We would like to know about any influences that has inspired your poetry and writings. SCOTT: Through the years I’ve been inspired greatly by countless authors, artists, musicians, and teachers, but a short list of some of the most important would include: my mother and father, Hunter S. Thompson, Henry Miller, Jack Kerouac, Friedrich Nietzsche, Joseph Campbell, Joe Casey, Roger Zelazny, Robert Silverberg, Eddie Vedder, Maynard James Keenan, Charles Bukowski, ThichNhat Hanh, Jesus Christ, Lao Tzu, and the Buddha. OPA We would also like to know; how do you relate the present literary trends with the literary heritage of your country? SCOTT: I am far from being a scholar or expert on the literary heritage of the USA, but generally speaking I think that the trends of this society have always been multicultural because of the melting pot aspect of how many different types of people have travelled here from other countries to assimilate. And so this has been reflected in there being many strains of literature available, if not in academic circles then at least in smaller cliques, cults, and scenes of the underground. To this day, it seems that the same type of energy is reflected in the wide breadth of material that can be discovered if one but peers beyond the institutionalized cannon and sets eyes upon the small market and independent presses that publish such great work. OPA Do you believe that all writers are the product of their nationality? Is it an incentive or an obstacle in becoming an international writer? SCOTT: It seems to me that local cultures within the larger nation state serve to influence individual writers more than anything. The experiences of their core environment (family and general community) are more important in shaping their views. To consider another perspective, however, in this age where the internet connects almost the entire world at the press of a button, all cultures have begun blending to a certain degree. Perhaps now the path toward being an international writer is more wide open than at any other point in history. OPA What 7 words would you use to describe yourself? SCOTT: Dreamer, Romantic, Hopeful, Peaceful, Spiritual, Simplistic, Optimistic. OPA Is there anything else that you would like to share or say to those who will read this interview? SCOTT: I would just like to take a moment to appreciate the editorial staff at Our Poetry Archive for supporting my work and providing an opportunity to answer these questions. It has been a wonderful experience for me, and I hope that the readers at your venue will consider picking up one of my books if they find enjoyment in my work. Thank you! Poet of the month !!! Poet of the whole Year ! That is what I think ! You are truly gifted with the literary Arts !!! Wow. There is no stopping Scott Thomas Outlar ! Amazing writer! His books will one day line up under "O" in all of the libraries, to pass on to the Poetry world!!! !